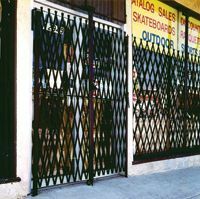 Keep you business safe after hours with scissor security door gates. Door Gates secure loading and receiving dock doors, doorways, garage and service doors, hallways and entrance-ways without diminishing visibility or air circulation. For narrow openings, single folding door gates.